Before Cy settled back into the Drake Room in the 1960s, where he had previously played in the post‑World War II years, he performed at almost every room of note in New York City, and in several choice locales elsewhere. One of his initial appearances in New York was at the Algonquin Hotel during 1939-1940 as accompanist to Greta Keller, a Viennese chanteuse, with the two then appearing together in San Francisco. 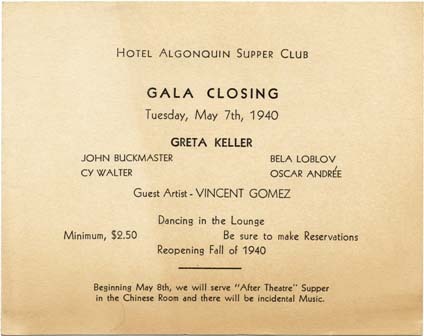 (That appearance became historically significant in that Cy and Greta opened the Algonquin’s Supper Club, later to become known as the venerable and beloved, and now sorely-missed, Oak Room.) Returning to New York, Cy happily found himself in demand due to the success of his Liberty Music Shop record releases and nationwide radio show appearances. In the years to come, Cy would perform at various venues outside of New York, including Cape Cod, Massachusetts; Minneapolis, Minnesota; and Colorado Springs, Colorado. Without question, however, his home base remained New York, both as a solo pianist and as an accompanist to singers such as Lee Wiley and Mabel Mercer. The announcement cards and adverts included here chronicle Cy’s appearances at rooms across the city, many with legendary histories of their own. When read in tandem with the various news articles contained elsewhere on this site, these announcements provide a partial, but nonetheless fascinating, chronological roadmap of a café society pianist’s colorful career. Copyright © 2019 Cy Walter. All Rights Reserved.